When the first world war broke out in August 1914, most of the sea front batteries were from the end of the 19th century. The sea front started from an island of Melkki and continued through old Sveaborg (Viapori) to Santahamina. Batteries were made using stones, bricks, soil and sand. First concrete batteries were made in the beginning of the 20th century. Guns were old, from the 1870'ies. There were less than dozen modern 152 mm (6") Canet cannons and 57 mm (6 pounder) rapid fire cannons. Building of new batteries were started a couple of weeks before the war broke out. New batteries located in the outer sea front on islands of Pyöräsaari, Miessaari, Rysäkari, Katajaluoto, Harmaja, Kuivasaari, Isosaari, Itä-Villinki and in the cape of Skatanniemi. Old 19th century batteries belong to the inner sea front. Some islands had also rapid fire guns and anti-aircraft guns caliber 57 and 75 mm. Old guns were moved to the land front after new guns arrived to sea front batteries. Most of the Russian troops left the islands year 1918. Sea front batteries with accessories were transferred to the Finnish coastal artillery. The fortified islands kept their strategic importance almost to present. Most of the islands are still military areas. 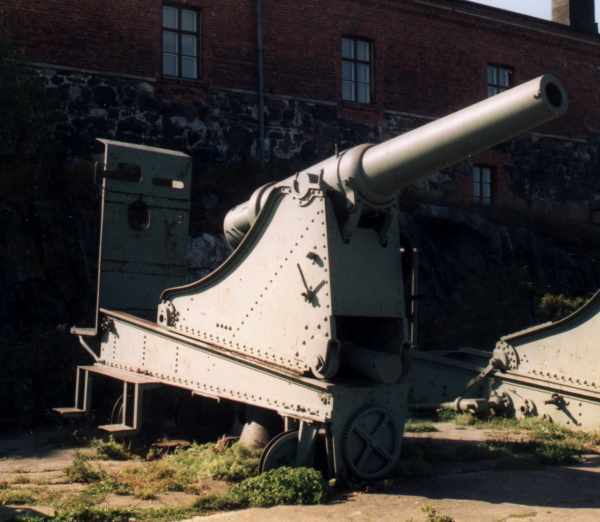 However few batteries are in public areas, older batteries on the island of Harakka and in Sveaborg-Suomenlinna museum area and newer concrete batteries in the Skatanniemi and Pihlajasaari. Sea front islands during the first world war. Also the main fairways are marked.